With a beautiful and catchy song portrayal of what life is like growing up and pursuing one’s dreams, Canadian singer- songwriter AKA V is embarking upon a bright future as a musician. 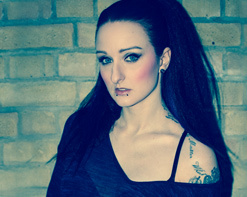 With a songwriting style that reminds of brilliant female artists such as Sheryl Crow or Shania Twain and a vocal interpretation which hints on Gwen Stefani, AKA V, also known under the name Vanessa Huneault, has all the right ingredients for a promising start in the industry. Her single ‘Always Go Home’ is an autobiographical account of a young woman leaving her home and aiming for the big city to realize her ambitions of becoming a musician. The song was inspired by her own story of leaving home and aiming to fulfill her goals. After growing up in a small town in Quebec where no one speaks English, she decided to hit the road at the age of 20 and packed up her bag to move to Ontario. She learned how to speak English and started a completely new life for herself. AKA V eventually moved to Toronto where she began to focus mostly on her musical career. She took singing lessons and started to play shows. Determined to make it in the music industry, the singer decided to get an education in Audio Production and Engineering to understand how to record and master her own tracks. During that time, she also joined the Canadian rock band OzGoode and went on a national tour with them as their singer. For the new video “Always Go Home,” AKA V recreates an intimate recreation of her journey. It begins with her passionately explaining to her mother why this is a choice she has to make. Her arrival in London is a whirlwind of excitement as she discovers the brand new world around her. In time, however, the loneliness and the distance takes its toll, and not even her ambition can suppress those feelings any longer. As she wanders the streets outside she catches a glimpse of future version of herself, one that has gone down the wrong path and fallen victim to many of the vices and predatory nature of the metropolis. Realizing that is not the future she ever envisioned for herself, she knows what she must do…. We’re so happy to be working with the AKA V team to bring you this inspiring new video and introduce you to this stellar talent. Please get in touch with us here at HIP Video Promo and let us know if there’s anything we can do on our end to help get this video into your programming. You can contact Andy Gesner and the HIP Video Promo team at (732)-613-1779 or email us at info@HIPVideoPromo.com. You can also visit www.AKAVmusic.com for more info on AKA V.